The stock market and economic commentators change their minds about the state of the economy almost on a weekly basis. The signals are mixed. It varies considerably from continent to continent, and even within regions. Is it any wonder leader managers increasingly face uncertainty. 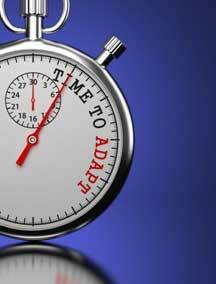 In the face of this uncertainty the watch-words for leaders are 'Adaptability', and 'Resilience'. This amazing creature is a highly specialised lizard that has a rather unique ability to choose the best environment that meets its needs over seasons and times, and to change colour to blend in with its chosen environment. Chameleons are also distinguished by: their feet which allow them to adapt their grip on a wide variety of terrain; their separately mobile, stereoscopic eyes; and, their very long, highly modified, rapidly extrudable tongues. Many species also have a prehensile tail which is uniquely adapted for climbing and visual exploring. They are survivors and are known to be resilient and persistent hunters. Like the lizard, leaders have to be much more "adaptable" in their approach to people, processes and plans since following the "company formulae", which worked during the times of less uncertainty, just does not work when changes occur at an ever increasing pace. They have to choose the environment to be in; change their ‘colour’ (perspective); get a different 'grip' on the terrain (their operating environment); be better informed with stereoscopic vision; move far more quickly (like the lightening tongue); and, become resilient and persistent in their endeavours. In today's business world, the complexity and pace of change can be daunting and adaptability has become recognised as a necessary skill for leaders to develop to be effective. As leaders rarely know what they can do to become more adaptable and foster adaptability in others, this article aims to contribute to a greater understanding of how to adapt. When things are going well most people can operate to high degrees of success, finding value and enjoyment in what they do. 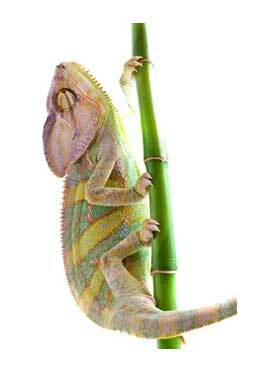 It is only when faced with adversity that true Chameleon tendencies have a genuine opportunity to shine through. Ongoing change means new decisions need to be made. Business decisions are frequently flawed. One study of corporate mergers and acquisitions—some of the highest-stakes decisions executives make—showed that 83% failed to create any value for shareholders. When another research team asked 2,207 executives to evaluate decisions in their organisations, 60% of the executives reported that bad decisions were about as frequent as good ones. New more dramatic problems, such as those caused by the GFC, or a sudden sharp downturn in demand of particular products or services, contain difficulties which leaders may not have the appropriate skill set to resolve. Ironically, most leaders see themselves as agents of change and imagine that change will not happen in an organisation without their knowledge or direction but this is often not the case. Unfortunately, most of us do not recognise our change limitations. We see ourselves as adaptable when the reality is that we all have our comfort zones that we tend to operate within. The higher we are in the leadership hierarchy, the less adaptable we become as we secure more discretion and power. We are in control and we can manage the world around us. When circumstances change against our interests, we have the ability to change other variables to keep it all within our comfort zone. This is interpretation of change through our own lens. We therefore deny that we are change averse and fail to look at changing ourselves. It is this inability to adapt to change that can lead to a leader’s undoing. Being comfortable trying a more fragmented and dynamic style where agendas are constantly changing. In the face of uncertainty be prepared to search out more and better information, but as quickly as possible. See deadlines as important but realise no one actually dies – not all deadlines are equal. Determine to be more open minded and curious and be prepared to change your mind according to new information. Emphasise diagnosing over concluding and resolving more often. It is important to really understand what is going on. Better tolerate ambiguity especially in new or critical areas. So with either managing gradual change or major episodic change, inclusion of others in grappling with the problem is a necessary first step. This means seriously involving other members of the team. By doing so leaders supplement their own set of skills and abilities, they use the insights of their team members to identify the issues, and they draw on the strengths of their team members to find the best solutions. As a result, those solutions also represent a broad array of perspectives which gains them support and makes them more able to stand up under scrutiny and challenge. Being an effective leader requires sharing the decisions and enabling the organisation to arrive at the correct solutions by involving the right people at the right time. So a leader’s propensity to include others is critical in developing adaptability and sustaining business performance in an ever-changing business environment. A wise leader may choose to take account of the opinions of others still reserving the right to make the final decision. Engagement with staff (i.e. releasing discretionary effort) is vital to leader effectiveness. Change management should be multi-disciplinary, touching all aspects of the organisation. However, at its core, implementing new procedures, technologies, and overcoming resistance to change are fundamentally human resource management issues. there is fear of personal loss (e.g. job, social). So helping others cope with change is also the role of an adaptable leader. 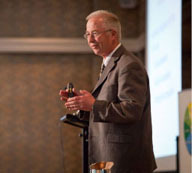 The leader's challenge in dealing with change is to recognise and understand the patterns of response that people express as they move through transition and to tailor intervention strategies that help individuals move forward in the changing environment. It is imperative that key parties are identified early in the planning stage. Asking who, when, how and where type questions will ensure that these identified key parties are regularly kept informed of progress in any relevant change initiatives. When the change pressure is at its greatest it is all too easy to be so engrossed in the project that key stakeholders are overlooked. This is where there might be a need to adapt the plan. Stereoscopic vision may be necessary here with the need to fully investigate the external and internal environment, and to see the strategic picture as well as the minutia. Changes in technology, for example, have created both business opportunities and casualties. A leader needs to regularly re-visit the ‘business and the environment they are in’ and decide through a wider involvement process, the future scope of the business, team or entity. This involves deciding size, structure, what work/product/service is included and what is not, and the geography of where best to operate. Then the planning process would need to align the operation such that it both blended into that environment but also, like the unique nature of the Chameleon, differentiates itself such that it was successful. Some organisations, teams or entities in responding to change and a new direction or leadership vision, seek to change their image and even their branding. This can arise out of identification of an opportunity or closing down a threat. Fonterra, for example, the largest exporter of milk products in the world, a few years ago changed its name from a more parochial New Zealand Anchor brand as it ever expanded its global reach. The change was driven by de-regulation and an expanding Asian market opportunity. All leaders have a limited set of skills. Skills they possess are the ones that they have relied upon and been successful with over the years. As with any other such asset, they have come to lean on those skills as their primary skills for leading their team or organisation. Unfortunately, as is often the case, they have not been required to ‘learn new tricks’. Changing circumstances also require new capabilities and processes. This can require a leader and their teams to gain new knowledge and learn new skills. Ultimately this can mean ‘getting a new grip’. Where some are unable or unwilling to grow a ‘prehensile tail’ or learn to hold on with their toes, hiring the skills externally becomes a necessary part of the survival plan. The fast action tongue like action of the Chameleon is symbolic of the need to increase the pace of the above changes. Agile leaders need to adapt, but they also need to do it quickly. It is those who proactively learn to change, at least at the rate of change, who will be the leaders of the future. Leaders can also make a difference in how well they and their team cope with pressure by using some simple techniques to strengthen their overall resilience. They should try to be optimistic in spite of the circumstances. Being negative and pessimistic is likely to have the opposite effect to that which is intended both on the leader and their colleagues. 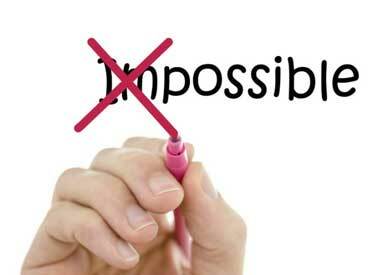 Optimism is the characteristic that is the basis of positive thinking. It gives people a generalised expectancy that they will succeed in their endeavours. Positive leader feedback can help a team stay positive. Any feedback should be clear, as close as possible to an observed event and specific about what should or should not continue. This can be seen as an opportunity to: clarify role contributions; link events to the team goals; clarify performance standards; and provide recognition of accomplishments. For leaders to expect success from others gives those people the will to expend effort to reach their goals. This expectancy will work all the better when the leader also shows they know their own strengths, are motivated, optimistic, persistent and resourceful. 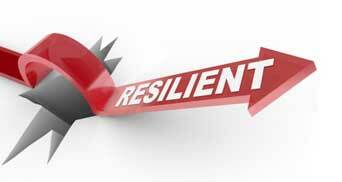 Optimism and a high achievement orientation will help with resilience against difficulties. Leaders who excel are usually driven by a desire for high achievement and set important priorities. When a leader is naturally good at something, it is easy to gloss over it or even discount it. We often don't give ourselves proper credit when due. So leaders should develop a plan to better use their strengths. They should try to identify developmental opportunities that will help them build on their strengths in such a way that they can better serve the needs of the organisation and at the same time achieve their own goals. By working proactively to strengthen resilience leaders will find that they hold up better under pressure, adapt quickly to change, get the right things done with fewer mistakes, and are sick less often. Resilience is not an ability one ‘has’ or ‘does not have’ as it can be developed, just as a proficiency in any sport or activity can be learned and developed. Leaders need to obtain the support of their own bosses and to have processes in place to maintain essential organisational support (e.g. reporting, sign off at key points, steering committees etc.). When a leaders’ approach to people, processes and plans has the aforementioned suggestions in place they are far better able to cope with change and become a Chameleon. Essential ingredients include being in, or moving into, the appropriate environment with people that are involved and consulted; determining the best fit vision, scope, skills, structure, and image, and; then being resiliently and relentlessly persistent and realistic. Then just when things appear to have ‘settled’ do it all over again until the process of change management becomes continuous adaption.